Every popular American spy novel and film of the past half-century has had to contain a Russian character, usually in the form of a femme fatale or a burly, deep-voiced brute. Is there a strong historical basis for this? Did the US and Soviet Union conduct espionage as extensively as the movies would make us believe? The short answer is “yes.” While it is true that there were far fewer explosions and self-destructing messages than portrayed in this particular sub-genre, both superpowers employed vast intelligence and espionage networks in order to gather information about each other. The 1964 bugging of the US embassy in Moscow is a good example of this, as it served as one of the most pervasive and prolonged acts of espionage discovered during the Cold War. Image of a bug found in the US Embassy in Moscow in 1964. Courtesy of the LBJ Library. On the morning of April 29, 1964, the American embassy in Moscow sent a telegram to the Department of State in Washington detailing the discovery and the beginning of the removal of microphones, eventually found to total more than forty, hidden within their walls. According to a situation brief from Secretary of State Dean Rusk to the American embassy, the U.S. had long suspected that their facilities in Moscow were bugged. Regular sweeps and frequent probing of the embassy’s walls, however, had never shown any evidence of the presence of microphones. According to Rusk, they had done everything “short of physically destroying a room.” Rusk states in this telegram that the hidden microphones were only discovered as a result of a ”decision to do some extensive physical damage to an area in Embassy.” According to this telegram and as reported in “Red ‘Bugs’ Found in U.S. Embassy,” an article in Long Island’s Star-Journal, after demolishing an inner wall, embassy staff discovered the first covert listening device located inside a wooden tube 8-10 inches behind the wall’s surface. It was only after finding this first microphone and following its wires that they realized the pervasiveness of the bugging. 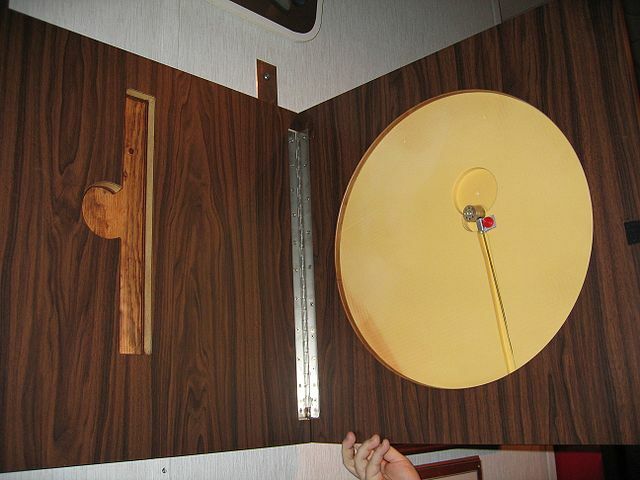 The foundations of every single room, including the bathrooms, were bugged, with the exception of a specially designed “room-within-a-room.” As the Star Journal report states, due to the age and obvious rusting on some of the microphones, it was clear that the embassy had been bugged since the Soviet government had leased the facility to Americans over a decade prior to their discovery. 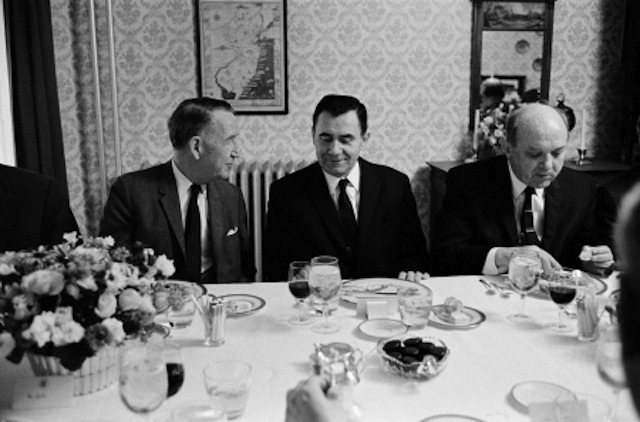 L-R: US Ambassador to the Soviet Union Llewellyn Thompson, Soviet Foreign Minister Andrei Gromyko and Secretary of State Dean Rusk in 1967 during the Glassboro Summit Conference. Courtesy of the LBJ Library. In a press conference on May 19,1964, James L. Greenfield of the Public Affairs Bureau and Marvin Gentile, Deputy Assistant Secretary for Security at the time, announced that more than 130 microphones had been found in American embassies in Eastern Europe between 1949 and April 1964 when the Moscow bugs were detected. However, none of these other microphones were part of such an extensive system. 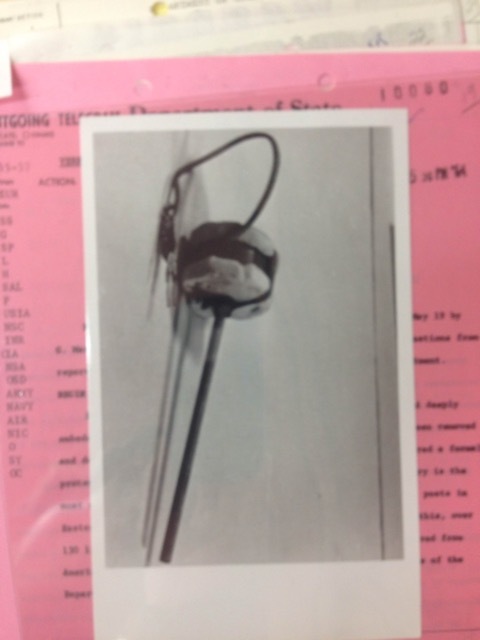 After the removal of these microphones, embassy staff there evaluated the size of the security breach resulting from the unprecedented 12-year Soviet bug infestation. Many reports were sent to the White House by different members of staff at the embassy detailing the precautions they took in their correspondences and conversations. In fact, as a circular telegram sent out by Rusk to numerous embassies in Europe states, all members of staff at the Moscow embassy were instructed as a matter of procedure to always assume they were being watched and listened to by the KGB (Soviet secret police). At the press conference Gentile stated that, “We will never operate in any post behind the [Iron] Curtain except under the assumption that a place is bugged.” He then claimed, “That is the only way we can operate in Eastern European countries.” In a report to National Security Advisor McGeorge Bundy, Rusk claims that he often made statements “in the hope, if not expectation” that they would be overheard by the Soviets. All these reports stated that, to all embassy staff members’ knowledge, no ultra-sensitive information was leaked. However, according to the article in the Star Journal, a meeting of U.S. consular officials had been proposed to take place at the American embassy in Moscow. The “room-within-a-room” where most important meetings were held was not large enough to accommodate all of the meeting’s members. Therefore, if this proposal had gone through, they would have convened in a larger, and therefore bugged, room. Because the hidden microphones were discovered first, Rusk rejected the meeting’s proposal and it never took place. If it had, unbeknownst to the US, the Soviet Union would have gained profound insight in American consulate operations during the peak of Cold War tensions. Another problem at the time was how to officially declare the discovery of these bugs to the Soviet government. A memo for Bundy from Benjamin H. Read, Rusk’s Executive Secretary, states that it was likely that the Soviets already knew that the bugs at the American embassy had been discovered; it was assumed that they heard the moment of detection through the bugs themselves. However, the U.S. needed to inform the Soviet government that such blatant acts of espionage would not be taken lightly. Embassy staff drafted a formal protest intended for U.S. Ambassador to the Soviet Union, Foy D. Kohler, to present to Soviet Foreign Minister, Vasily Kuznetsov. The first draft is written in flowery complimentary language, giving Kohler the “honor” of informing Kuznetsov and the Soviet government about the discovery of the bugs. After edits, the official protest was written in much sterner and stronger language, detailing the U.S.’s serious displeasure of the USSR’s “flagrant contravention” of Article 22 of the Vienna Convention, which invested the host state with the responsibility of assuring diplomatic missions safety against intrusion. As Kohler reported to Rusk, Kuznetsov openly wondered why such a “strong” protest was issued. He recalled several prior occasions, when Soviets found similar bugs in their facilities in Washington, but Soviet government had issued no such protest. According to the memorandum to Bundy, Kohler replied to Kuznetsov that due to the extent of this particular bugging, a “strong” protest was indeed warranted. However, later, after the Soviet Union’s subsequent official rejection of the U.S. protest, Kohler privately confirmed Kuznetsov’s claim, listing multiple cases of American espionage that the Soviet Union cited in its rejection of the U.S. protest including the discovery of listening devices in a table leg in the USSR mission to UN and microphones discovered in vehicles belonging to both a military attaché in the Soviet embassy in Washington and of the Third Secretary of Soviet UN mission. While the Moscow embassy bugging and the American bugs mentioned by Kuznetsov were by no means the only large-scale acts of espionage between the two superpowers during the Cold War, they demonstrate the lengths that both sides were willing to go to in order to gain an edge in their worldwide struggle for supremacy.